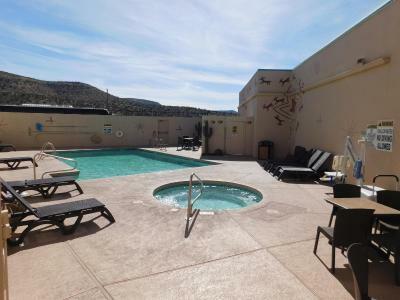 Lock in a great price for Hualapai Lodge – rated 8 by recent guests! They breakfast was excellent. Location for Havasupai was perfect. Would recommend highly as your last stop before the hike into the canyon. I left without breakfast. Will be coming back with husband and have breakfast. The staff was incredibly friendly and helpful. They went above and beyond. We had the nicest waitress at the restaurant. I wish I could remember her name. She was darker skin and her hair was dyed either blue or purple. Of all the people at the hotel and the restaurant, she was hands down you're straining star. We appreciated the restaurant opening so early at 4am since that allowed us to eat before our early start to hike Havasupai. We stayed here while on our way to hike to Havasupai. The beds were very comfortable, and the staff was incredibly friendly. I loved that the restaurant opened before sunrise to accommodate all the hikers. The breakfast sandwich was delicious! 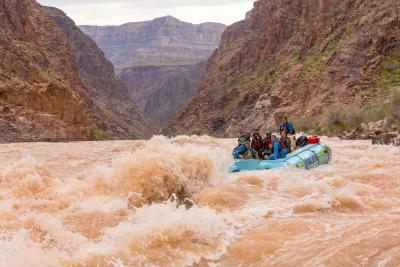 Is the great stop between south and west side for Grand Canyon. But is in the middle of Nowhere. Great breakfast. 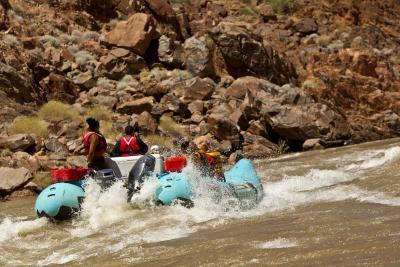 The Hualapai Lodge is not your typical hotel in a “pass through” town. 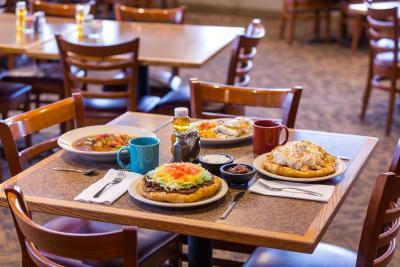 The Lodge is beautiful offering a great selection at their restaurant as well as very clean facilities! I found it to exceed my expectations as I was just looking for a place to rest during a road trip. If I am in this area again I will be delighted to stay here! 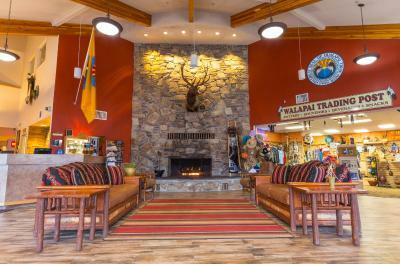 Hualapai Lodge This rating is a reflection of how the property compares to the industry standard when it comes to price, facilities and services available. It's based on a self-evaluation by the property. Use this rating to help choose your stay! 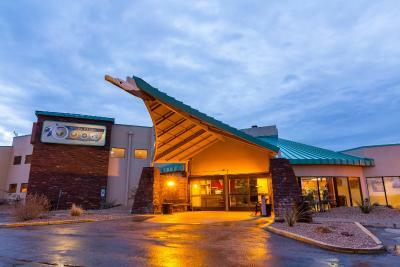 Located on Route 66, this lodge is less than 20 miles to the base of the Grand Canyon. A seasonal hot tub and a heated outdoor pool are featured. 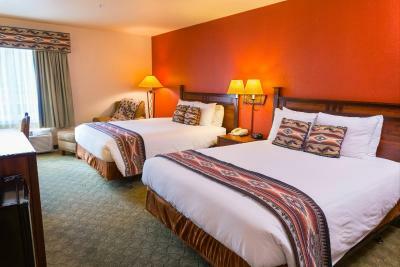 Each room offers a flat-screen cable TV, a seating area, free Wi-Fi and contemporary furnishings at Hualapai Lodge. Coffee-making facilities are provided. A full-service restaurant is also featured on the property. The fitness center and business center are available onsite for guests' convenience. Concierge services are featured. 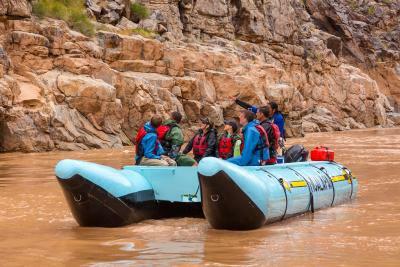 A variety of activities can be enjoyed onsite or in the surrounding areas, such as whitewater rafting, fishing, or touring the Grand Canyon. Kingman Airport is less than 45 miles from Hualapai Lodge. The Grand Canyon Skywalk is 122 miles away. This property is also rated for the best value in Peach Springs! Guests are getting more for their money when compared to other properties in this city. When would you like to stay at Hualapai Lodge? Adobe inspired, this room has a flat-screen cable TV, a sitting area, free Wi-Fi and contemporary furnishings. Our property is located on Historic Route 66 in Peach Springs, AZ. 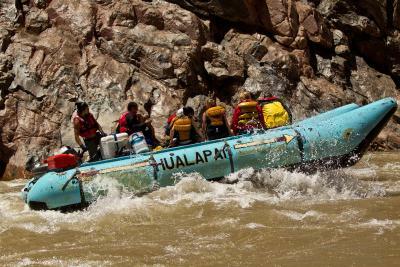 Guests can go White Water Rafting on the Colorado River with the Hualapai River Runners. Information on Grand Canyon West Skywalk and local tourism attractions information is available. Santa Fe Railroad is located behind the property so please be aware that trains pass by 24 hours, 365 days out of the year. House Rules Hualapai Lodge takes special requests – add in the next step! Hualapai Lodge accepts these cards and reserves the right to temporarily hold an amount prior to arrival. Please note that the current pool hours are from 08:00 to 11:00 and from 16:00 until 20:00.The hot tub is currently closed. Better cell service in the area, but the hotel can’t control that. I need to call to get the $50. hold returned after checkout as promised. So far from the Grand Canyon but the only accommodation recommended on the West SkyWalk website. It was a 2 hour drive from the SkyWalk. Some of the restaurant staff seemed a little grumpy. Nice clean hotel with very comfortable beds and great pillows. The food in the restaurant was ok but not great. The train going by at very regular intervals was quite shocking at first but didn’t really affect my stay. Walls are very thin. You can hear everyone and you can hear when a train passes by, every time. Nice room and friendly staff. They were especially great sorting out a booking issue. The train whistle screaming right behind the lodge seemingly every hour through the night. We chose the location because it was closest to the trail, but none of us slept well so it may have been worth a longer drive to get quieter better sleep. Middle of nowhere - no phone signal, like lost on Route 66.